This week as part of the food series I would like to discuss an interview with Michael Pollan, food journalist and author of Cooked and The Omnivore’s Dilemma and Moises Velasquez-Manoff, author of An Epidemic of Absence that I heard on the radio. The podcast is available here so after I have wet your proverbial appetites you can go and listen to it. The interviewees discuss how processed food is effecting our health, and why. As I noted in a previous post in this series, the money is in the processing, not the actual foodstuffs themselves. According to the price of a bushel of corn ($6) a large box of corn flakes holds about 7c (US) of corn, the rest is processing, packaging and transport. This unfortunately means that the more processing involved, the more profit can be made. Today I bought a loaf of bread, and on the wrapper is written “No high fructose corn syrup”. Now if you look through the ingredients in your kitchen you will find this product in almost everything, but why? Bread is a simple thing to make, flour, water, yeast and salt. But my bread has 25 ingredient on the label, including a few that are difficult to define (dough conditioner for example) although not the dreaded high fructose corn stuff. It is made with enriched flour, and enriched flour is exemplary of the food industry’s approach. White flour is so highly refined that it has lost much of its nutritional value, but instead of refining it less and eating it brown, we choose to add (in this case) 6 different substances to give it back some of the nutrition that has been removed during the refining process. It’s great bread too, if you leave it in the original bag it will last for weeks, I only bought it yesterday although it was baked on 17th December but is still remarkably fresh. And this is the processing problem, it has to last, be easily stored, and not taste like it was cooked a month ago, so all of this stuff is added and others taken away. One of the things that producers aim for is to get rid of all bacteria, as bacteria leads to age, so industrial products are sanitized as much as possible. They contain very little fiber because fiber is difficult to store and freeze, and they are made in layers of sugar and fat so that they leave a craving, so you eat more processed bread that home made bread because you continue to crave it (it’s a chemical thing, not greed). Now the food industry produces all of this fine ready to eat fodder so that we don’t have to slave over a hot oven all day. In the US, food preparation time is down by 40% since the late 60’s so we have had more time to go to work, drive home, play space invaders and Tetris and watch our VHS tapes turn into DVD, and streaming. This has also led to changes in how we eat. Today we have TV dinners, ready served in a heat proof disposable tray, and here in the USA 20% of all food is consumed in the car. All of this has had an effect upon the human body in terms of bacteria. Humans have lots of bacteria living inside them (more bacteria than human cells), but these processed foods are killing of this good bacteria. The foods have very little fiber, and this is bacteria’s favourite feast. Even eating just one fast food meal has an immediate effect upon the bacteria in the stomach and intestines, they get inflamed and stop working properly. Studies have found that overweight people have inflamed bacteria, although it is unproven if this is as a result of being overweight or has worked towards making them overweight, but there seems to be a link. It could be that this is more of a problem that sugar and fat content. Incredibly enough though these problems can be overcome quite easily, a glass of freshly squeezed orange juice with each meal dramatically improves the situation and helps the bacteria fight the onslaught. Some think that endlessly feeding antibiotics to animals that go into the food chain for consumption may also have an effect as residue can also kill the bacteria, but that is another story. One very interesting find is reported in the interview. People living in industrial sanitized countries are suffering ever more frequently with immune deficiency problems, and one reason might be this lack of bacteria. In a study that took place between Finland and Russia, ethnically similar peoples suffer different rates of immune deficiency depending on their upbringing. Those living in poorer conditions suffer less from these problems, as do people living on farms in less hygienic conditions in industrialized countries, and children who go to day care fare better in the long run too. It also turns out that human breast milk contains a lot of this bacteria, and this is the major contributor to building up immunity that is missing in formula milk. On a personal note as father of 2 small boys I would like to add that last year several articles appeared about a doctor who claims that easting nose mucus (snot, boogers) may actually help introduce pathogens into the child’s immune system that will strengthen their body’s natural germ defense, although this has not been proven. Have a listen to the podcast and check out the books on Amazon. Oh and eat some yoghurt and pickles. So how would you define fast food? Is it simply pre-prepared food, TV dinners or take-away burgers etc. I guess there could be good and bad fast food depending upon the fiber content. The whole bacteria issue is very interesting, apparently the bacteria that we have in our gut will vary dependant upon where we live. I’m also surprised that you can buy a loaf of bread that was baked in mid Dec at the end of Jan. It couldn’t have been your run of the mill loaf. In the case above the experiments were conducted with breakfasts from a famous American fast food chain. Now they have started to artificially put certain types of fiber into the food, although it tends to be one particular type, and not the broad range of fibre that our bodies require. Yes the types of bacteria in our organisms is dependent on what we eat more than where we live, but obviously diets change according to geography. Even a change from white to brown rice areas makes a lot of difference. Oh and the bread is a regular loaf of vacuum sealed white sliced. Fantastic article. I was gettig very worried, but the orange juice note was very reassuring. Procccessing is much more intense and widespread than I ever understood. Processing has always being a big part of the packaged food. That is why the packaging services and suppliers make such big fortunes from their services. On the other end, processing is necessary for food items as it improves security and safety. Most of the packaged food is bacteria free and safe to use. Yes I agree, the problem is here in the US (as in many other countries) some people live entirely on processed food. They talk about food deserts in cities where it is difficult to buy vegetables or fruit. 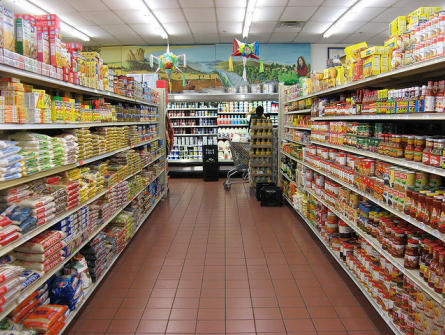 Convenience stores only sell processed food. The article is very informative Jonny! I didn’t know you could end up buying a month old bread loaf! Now that I know, I will try baking it on my own. Same goes for the food stuffs which I purchase but can be made at home. This is very much the idea that the so-called alternative food provisioning networks follow. If you have a look at my post that reviews Grasseni’s book you will find plenty of information and free links and downloads. The groups promote bread making, pickling and canning. Here in Massachusetts one of the groups is called “The Urban League of Canners”! Check out the website.